Really good hostel, liked the beds with the curtains. Gives you the feeling of privacy. Location was fine, I like walking so did everything on foot, walked lots of kilometers. The hostel was busy but not noisy or anything. Great for a weekend away. Nice hostel with nice staff. There was a big group that made a lot of noise. But in the dorn i didnt experienced Amy trouble of them. Hostel is close to metro station so good location. I would recommend this Hostel!! Perfect location, next to the metro station and on the main boulevard of the city of Budapest. Also close to the Jewish neighbourhood with its party spots. The hostel was very clean and the staff was helpfull. The free breakfast every morning was an added bonus. Only when we arrived the entrance of the hostel was hard to find since it is located in a residence of appartments. However all in all we enjoyed our stay here. I really enjoyed it here! They invest in organizing events such as parties/pub quiz/ bar crawls so I met a lot of people. The staff was very welcoming. 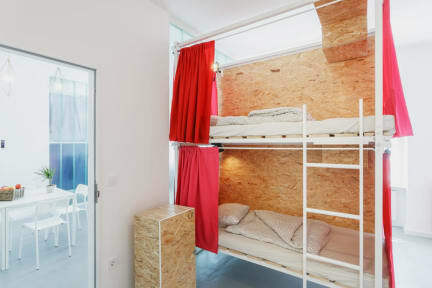 The photo's on their website are more accurate than the photo's of hostelworld. I booked a bed in the deluxe room, but in my opinion it wasnt that deluxe. The matress was super thin, so not that comfortable. But, I had a really good time here and would definitely return! Good place to explore Budapest. It has a great location in Pest so everything is on walking distance. Nice staff and the bar/livingroom has a relaxt vibe! Samen met een vriendin had ik een Deluxe room geboekt. De kamer was echter super klein en er waren geen gordijntjes voor de bedden. Daarnaast was het stikheet, we lagen allebei boven en het was gewoon niet te doen. Toen we onze kamergenoten ontmoetten bleek het dat twee van de bedden bed bugs (bedwantsen) hadden, dat waren bedden naast ons. We hebben toen ons geld teruggevraagd en zijn weggegaan en kregen een deel terug. Al met al een slechte ervaring. I booked a bed in an 8 bed women's room. Apparently, the hostel didn't have enough beds for the amount of guests they accepted, so they just put an extra bed in the middle of the living room and let me sleep there. Very uncomfortable. Otherwise, the hostel is fine. I had to pay 41 euro per night for a 8 mixed dorm with no AC the rooms dont have lockes and our things kept dicapering after the cleaners came in small things but still. i am pretty sure that they dont clean the beds properly becoase i got herpys from the bed. Diden't know that was posible.